The community first came together to guerrilla garden a neglected space on the Landor Road in March 2011. The first Edible Bus Stop germinated and grew from strength to strength throughout 2012 (read here, about the early days). At the beginning of 2013, after applications made by EBS founding members; Mak Gilchrist & Will Sandy – the site was awarded funding from Lambeth Councils Neighbourhood Enhancement Programme and The Mayor of London’s Pocket Park scheme. The re-designed garden, was the first Pocket Park to be realised and was opened on May 18th 2013 with a great turnout from locals and the press. 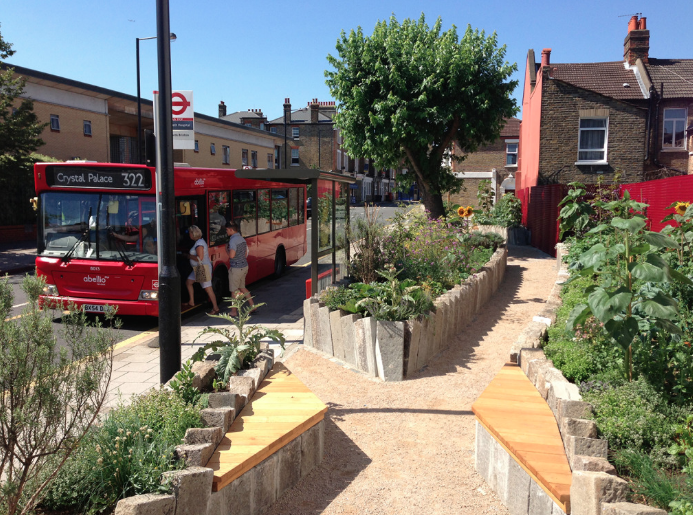 The layout utilises existing desire lines to allow easy routes through and the new benches are ideal to sit on and take in the garden, eat your lunch, or wait for a bus. Reclaimed granite kerbstones, salvaged from other redevelopment work across Lambeth, form the retaining walls of the raised beds. Dedicated local residents grow an array of edibles and bee friendly plants on the site. Leafy greens, herbs and towering sunflowers all thrive in the garden, which is an urban orchard with over 5 fruit trees planted. Gardening afternoons, where all are welcome to join in, are held on the second Sunday of the month with tools provided.